Sub: PNM/NFIR meeting held on 10th & 11th May, 2018 – Discussions on new/Agenda Items pertaining to EDPC-I - reg. A meeting on new/Agenda Items (list of 7 Items given overleaf) pertaining to EDPC-I has been, fixed for 09.08.2018 at 11:00 hrs. in Chamber of EDPC-I, Metro Building, Pragati Maidan, New Delhi. 1. 4/2018: Reckoning 30% pay for Pay Fixation in the case of medically decategorized Running Staff when posted against stationary posts-reg. 2. 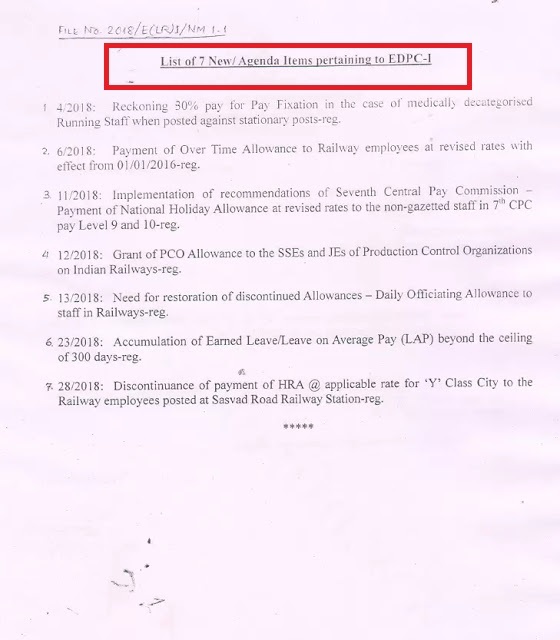 6/2018: Payment of Over Time Allowance to Railway employees at revised rates with effect from 01/01/2016-reg. 3. 11/2018: Implementation of recommendations of Seventh Central Pay Commission - Payment of National Holiday Allowance at revised rates to the non-gazetted staff in 7th CPC pay Level 9 and 10 - reg. 4. 12/2018: Grant of PCO Allowance to the SSEs and JEs of Production Control Organizations on Indian Railways-reg. 5. 13/2018: Need for restoration of discontinued Allowances - Daily Officiating Allowance to staff in Railways-reg. 6. 23/2018: Accumulation of Earned Leave/Leave on Average Pay (LAP) beyond the ceiling of 300 days-reg. 7. 28/2018: Discontinuance of payment of HRA @ applicable rate for ‘Y’ Class City to the Railway employees posted at Sasvad Road Railway Station-reg. Agenda Items (list of 7 Items given overleaf) pertaining to EDPC-I has been, fixed for 09.08.2018 at 11:00 hrs. in Chamber of EDPC-I, Metro Building, Pragati Maidan, New Delhi.